Cloud-Based Technology – Continuous improvement systems, like many (if not most) software applications today, are provided in a Software as a Service (SaaS) model. The vendor takes responsibility for managing the software on their servers and makes it available to your users 24x7 from anywhere. You enjoy all of the benefits of the solution without having to host or manage it. Mobile Applications and Device Independence - Improvement work is not confined to the desktop, and your improvement software shouldn’t be either. The best solutions offer Android and iOS apps and will work beautifully on tablets or phones. This takes the friction out of improvement work by letting your employees offer opportunities for improvement and work on projects from the devices that they love. 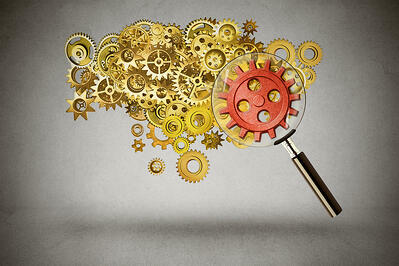 Data Security - Data security should be a central concern for any technology you evaluate. It is particularly crucial for improvement software because the system will almost certainly contain sensitive data that you want to protect. Look for a solution that uses secure web pages with data encryption. Robust Reporting - Improvement software should give instant insight into the people, teams, and departments that are engaged in improvement and calculate the impact of those efforts. You should be able to dive into engagement, activity, and impact with ease. Visual Management - Visualizing improvement projects and results ensure that people stay connected to the work and gives leaders an easy way to measure results and ensure that forward momentum is maintained. This might take the form of huddle boards, Kanban boards, impact dashboards, X-matrices, and wallboards. Configurable Dashboards - The needs of people vary based on their role. Executive leaders and individual contributors have different information needs and permissions. Look for continuous improvement systems that tailor the experience to the needs of each user. Notifications and Alerts - Notifications and alerts via email help keep people engaged and on track with their improvement projects. They let managers know when new opportunities are submitted, tasks are completed, or deadlines are missed. Advanced Search Capabilities - The ability to search the knowledge repository for past projects is essential to making sure that the information is used effectively to build on past successes or avoid mistakes. Success Broadcasting - Improvement culture takes off when people celebrate and announce success. Success broadcasting is a feature you’ll want to be sure is included in any solution you consider. Document Management – You’ll want to be able to store all documents related to improvement, such as Standard Work documentation, value stream maps, A3s, and more in your improvement platform. Be sure that it can support all document types including images. Expert Support - Make sure that you choose a provider with expert support services available. Ideally, you’ll be assigned a dedicated account manager for personalized assistance. Online Documentation and Learning - Most people prefer a self-service approach when using software, so look for a solution with an intuitive knowledge center with video training so that you can onboard new employees quickly. Continuous Improvement Resources - Technology is only one part of creating a culture of improvement. Look for a partner that can be a resource for your team with educational materials like eBooks, webinars, events, and videos. When you find a solution that covers all of these bases, you can be confident that you’ve made a smart choice and that you’ll put your organization in the best position to achieve your process improvement objectives. 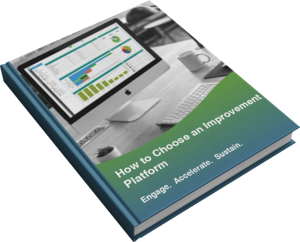 For more information, download this free eBook about how to select the best improvement management platform for you.